This superb example of walnut bellows consists of carved satyrs to the top forming the two handles, on one side the carved satyr has a carved armorial below with carved scrolling floral and foliate decoration, a circular, central carving of two cherubs tending a fire leading down to a winged lion holding a book, this leads down to a fire breathing dragon, this being symbolic to the bellows helping to light the fire - the lion possibly being 'The Lion of St Mark' which is sometimes represented in the form of a winged lion holding a Bible and is the symbol of the city of Venice. To the reverse side the bellows consist of a satyr to the top with further carved decoration with a mythical beast below - when the bellows are used the air travels through his open mouth. 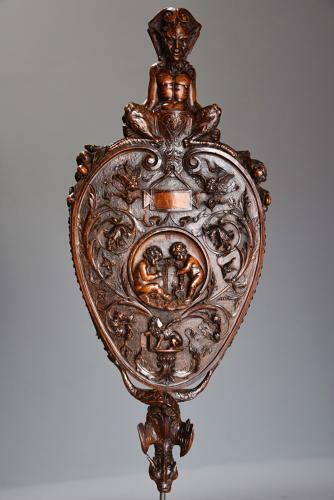 These bellows are highly desirable and collectable fireside items and are also a work of art, they would be a superb addition to any fireplace. Please note that the metal bar within the dragons mouth was put in place for photographic purposes only. The bellows are in excellent and original condition for age and can go straight into a home or collection.